A Study on construction method of folk house in the soft ground. A study on housing demand and supply and residential environment on local city. Making the basic plan of reconstruction the rented housing estate(MATSUGAOKA)owned by Fukuoka Prefecture. Making the housing policy for 5 years of Kitakyushu city. 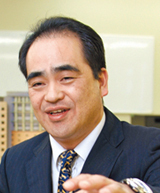 Making the renual plan of inner city of Kita-kyushu city. Making the replace plan of rented houses owned by Kita-kyushu city. Analysis of sitting-style in our country from a view point of the changing of living posture and reconsideraction of the planning of the gathering room in dwelling. Survey the remains of Machi-ya(urban-house)in a war-damaged city(Kurume city). Making the policy of improvement of the residential environment in Omuta city. A Study on the making the facilities standard for intelligent high school. A basic study on the formation of community and the arrangement of residential environment supporting child-care. A Study on Modern dwellings from a viewpoint of Housing Culture Theory.